At Old Czech Country we have created a wide variety of garden signs. Some have been primitive signs with chippy paint that look as though they have been around for years; others are more detailed. 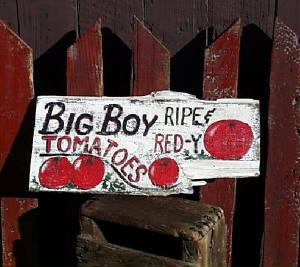 Some garden signs have folksy sayings, others display vegetables and fruit in ripe glory. Herbs and flowers also make appearances on our garden signs. Your choice will only be limited by your own imagination. Dream up what kind of garden sign you would like, and we will hand paint it at Old Czech Country. For prices and ordering information, click here to go to our online store, Old Czech Country.